How Does Colour Sets the Mood For Your Home? Although you may not realise it, the colours throughout your home can have a direct influence on your mood and thoughts. This makes it especially important to spend some time choosing the colours you will feature in your home. Certain colours and colour palettes tend to elicit a similar reaction. Variations among the tones and shades can be used to further influence your home’s atmosphere. Colour trends will come and go (as will flooring trends in general), so it is important to choose colours that reflect your personality and preference and then combine them into a pleasing mix. While it can be intimidating to choose colour combinations, it is not as difficult as it seems if you are equipped with the right information. Read on to learn more about how colour influences the atmosphere of your home and how to make colour work to your advantage. Certain colours can evoke certain emotions and create a particular atmosphere. What kind of mood do you wish to create? A peaceful, harmonious atmosphere? A cheery, energetic vibe? A calm space with a retreat-like atmosphere? Colours can help you achieve this. To help determine which colours and combinations will generate the feelings you are trying to evoke, use design blogs, magazines, and books for ideas. Also bear in mind that carpet, furniture, and tiles are only available in a limited range of colours, so they are important to choose first. Once you decide on your favourite colours, try to limit the number of colours per room to three or four at the max. Using too many colours may make a room look cluttered or chaotic. Since paint is relatively inexpensive and easy to redo, it might help to experiment a little. Colours influence a room in three main ways: neutral, active, and passive. Colour’s can be easily customised to fit your taste, the room’s purpose, and your personal desires. Light colours have an expansive, airy feel that helps make rooms seem brighter and larger. Dark colours have a warm and sophisticated vibe that can give larger rooms a more intimate atmosphere. If you are looking for a room bursting with energy, look no further than this intense hue. It is especially good at stirring up an atmosphere of excitement, especially at night. When used in dining or living rooms, red can help stimulate conversation and draw people together. Used in entryways, it helps generate a memorable first impression. Since the colour red has actually been shown to increase respiration and raise blood pressure, it is generally considered too stimulating for use in bedrooms. However, if the majority of time spent in your bedroom is after dark, the colour will appear elegant, rich, and muted. It is worth noting that deep shades of red such as crimson can make some individuals feel irritable, meaning these shades are best used as accents instead of the main focus. This sunny, joyous colour communicates happiness. With its energising, uplifting vibe, it is a great option to feature in dining rooms, bathrooms, and kitchens. For smaller spaces, entryways, and halls, yellow can create an inviting, expansive feel. 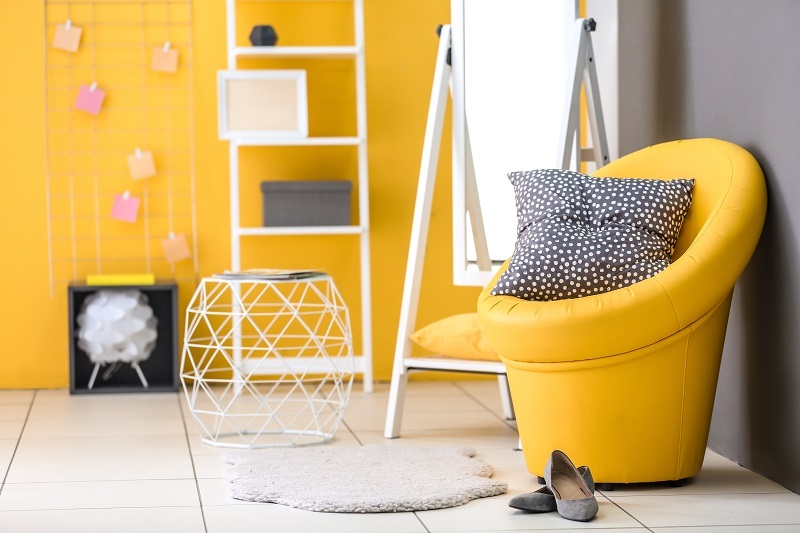 Although generally considered a cheery colour, yellow may not be the best choice for the main colour scheme as it can actually encourage feelings of anger and frustration when used over large spaces. Studies have actually shown that people have a higher chance of losing their temper in a home with a yellow interior and babies cry more often in yellow rooms. In chromotherapy, yellow is believed to stimulate the nerves and purify the body. Blue has actually been found to lower blood pressure, respiration, and heart rate, making it a calming, relaxing choice for bathrooms and bedrooms. Keep in mind that a pastel shade that looks beautiful on a paint chip may come off chilly, especially in a room with limited natural light. When using light blue as a room’s main colour, balance it with warm fabrics and furnishings. 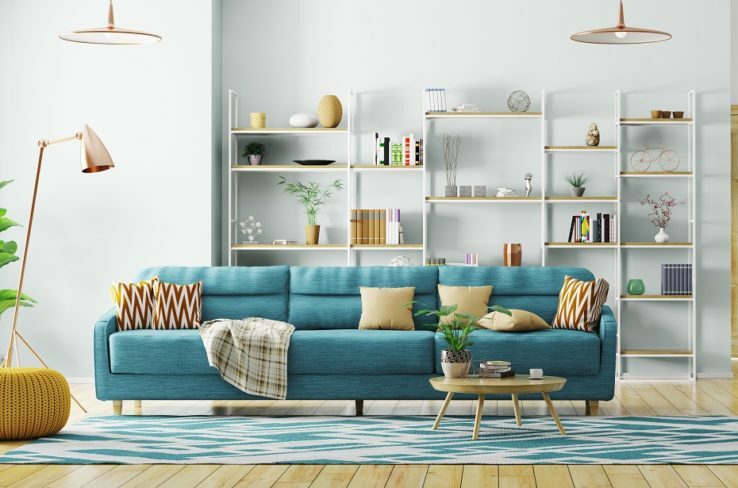 Warmer shades such as turquoise, cerulean, bright blues, and periwinkle help encourage relaxation in social settings such as living rooms, large kitchens, and family rooms. Blue is well-known for its calming abilities when used as a room’s main colour. However, it is important to opt for softer shades of blue as darker tones can have the opposite effect, evoking sad feelings. Considered the most restful colour, green combines the cheeriness of yellow with the calm qualities of blue and is well suited for essentially any room in a home. In living rooms, green is excellent at encouraging a soothing atmosphere that promotes togetherness and comfort. It also has a calming effect when featured as the main decorating colour and is even believed to help relieve stress. Purple, in deep shades such as eggplant, creates a dramatic, sophisticated, rich feel. It is associated with creativity and luxury and makes an excellent secondary or accent colour. Lighter shades such as lilac or lavender offer a restful tone to bedrooms without the chilliness that sometimes accompanies lighter shades of blue. This bright, energetic colour is full of enthusiasm and excitement. While it may be too stimulating for living rooms or bedrooms, it is ideal for an exercise room. Ancient cultures even believed that orange helped promote increased energy levels and healthier lungs. Neutral shades — black, gray, white and brown tones — are the foundation of most decorator’s tool kits. The beauty of these shades lies in their versatility — liven things up with more colour or calm things down by subtracting colour. Black is generally best used in small doses to add depth to a colour scheme. Many people never even give a thought to ceilings — even though they account for one-sixth of the space of a room — and simply cover them with a simple coat of white paint. For decades, white has been the go-to choice for ceilings. 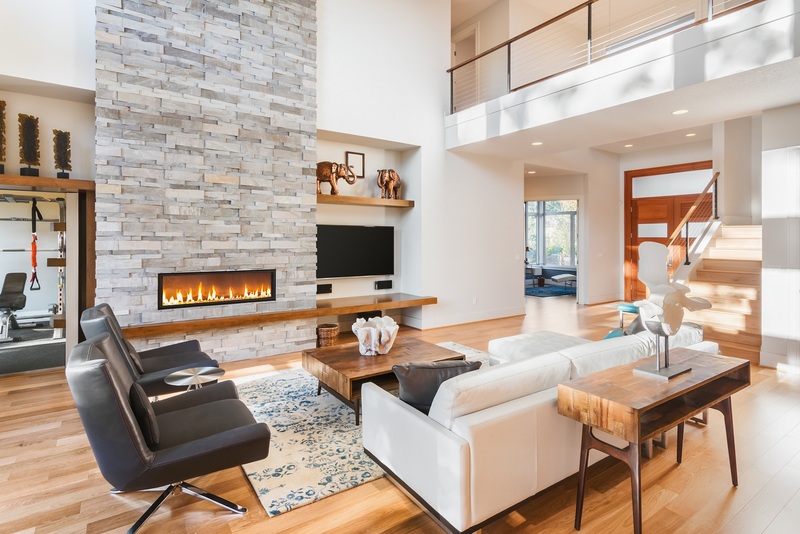 Generally, lighter ceilings help heighten the feel of walls, while darker tones can make walls feel lower and add coziness to an otherwise expansive room. It is well-known that dark colours make a room feel smaller and light shades make rooms feel larger. Flooring types come in a wide range of shades and colours that can fit in with any atmosphere you are trying to create. Earth colours are especially popular in today’s market. Keep in mind that darker floors help disguise dirt, but highlight dust, hair, and fur. Lighter floors help disguise dust, hair, and fur, but they tend to show dirt easier. If you prefer earth tones or lighter coloured floors, laminates and hardwood floors will be popular options to consider. For more colourful choices, vinyl or carpet will offer a wider variety. Hardwood floors – Timber floors are usually limited to earth colours. Manufactured in planks or strips, this timeless option can increase the value of your home and create an elegant, luxurious appearance. Timber often comes in pleasing colours that add a peaceful vibe to a home. Laminate floors – As a replica of timber floors, laminate also comes in earth colours. This makes laminate a versatile option for just about any space. Carpeting – If variety is what you desire, carpet has it all! This long-lasting type of flooring comes in basically any colour you could ever want. Despite the wide range of possibilities, people typically choose light coloured carpet so the room’s design can be colourful. Vinyl floors – This durable, water resistant, scratch-free option comes in a variety of bright designs and themes. Installed in a kitchen, flooring with blue or yellow tones can help stimulate appetite. Area rugs – Area rugs are a simple way to add a statement to any room. The colours and patterns available are practically endless and can be used to enhance flooring and pull colours from the room’s decor. Given how influential colours can be in your home, it is important to spend as much time as needed deciding on the colours you will focus on for furniture, walls, decor, and flooring. 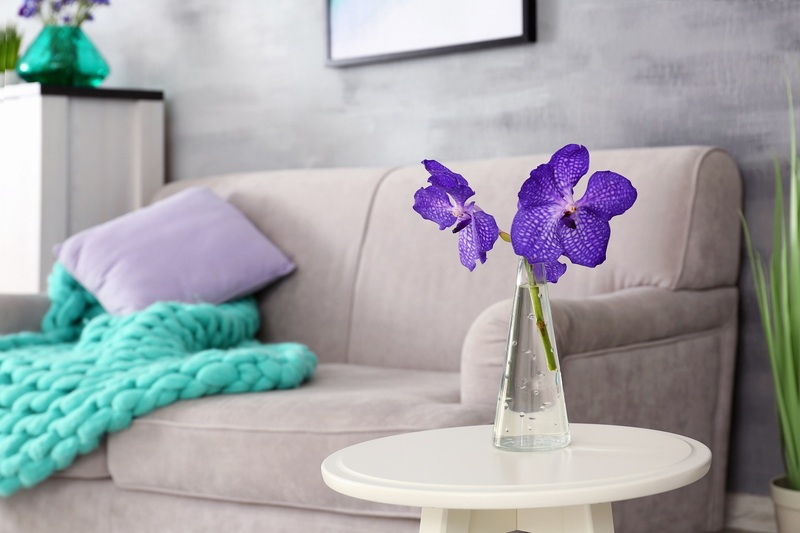 By finding colours that fit your personal style and complement your rooms, you can boost the value of your home and create a peaceful living space.